By diminishing the boundary between the architecture and its wooded site, this installation reveals both the humanly imagined and the dynamic natural aspects of the landscape. The installation also suggests the temporal and spatial tensions between them. Drawing on the imagery of ruins and abandoned buildings, the architectural fragments evoke the ghostly outlines of a vanished place and memories of an earlier time. However, these imagined outlines also enclose a dynamic physical landscape, a living forest, expanding and ever changing. Literally rooted in the present, this natural setting is defined by its architectural elements, but not displaced by them. This sculpture focuses our attention on one of the most productive and exciting places in the landscape. The forest edge. The transition between the naturally occurring forest, and the manmade field. A place where man has unintentionally provided habitat for plants and animals. The forest edge is also intriguing in another sense. The field is open, and the forest is enclosed. I thought that I would highlight this duality by reversing the placement of a manmade structure within this framework. What was once open is now closed, and what was once closed is now open. We can experience the forest edge. This sculpture with its minimalist architectural form comments on the relationship between nature and culture. The house envelops the tree, but as the tree ages it will eventually envelop the house. 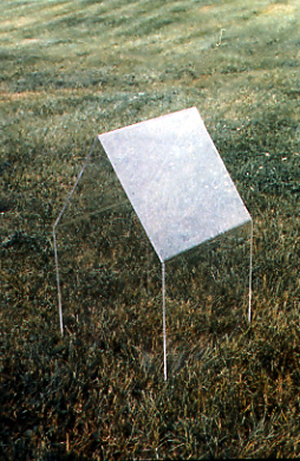 Siting a house in the landscape is a symbolic act. "The symbolism of that act is the twofold. It is a joining, a metaphorical marriage between the natural and the cultural. But it is also a primal act of differentiation." This sculpture makes reference to this metaphorical marriage. 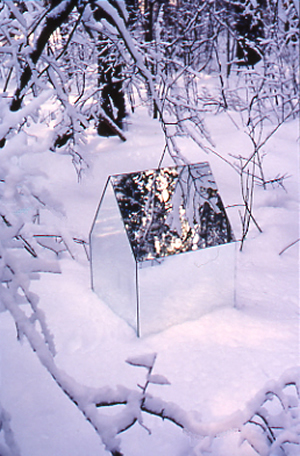 Built form is "cloaked" to reflect the natural landscape around it. Quotation from New York Times article titled "Two for the Roads: A Vision of Urban Design" by Herbert Muschamp. Approximate dimensions 22" Ht x 14" x 14"
Placing an object of desire out of context and out of reach. A house is not a home without a favorite comfortable chair in which we can seek refuge from the outside world. In this installation one of our favorite chairs (species - "Easy Chair") is exposed to wind, rain, traffic noise, and loud voices. It cannot escape, and you cannot rescue it. From a distance it is a simple steel box in the landscape. As one approaches it becomes clear that there is no top on the box. Anticipation mounts. 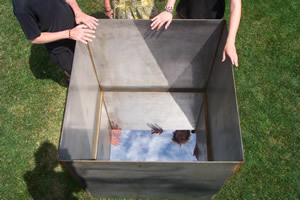 The viewer looks into the box revealing a mirrored reflection of oneself, and the sky above. Anticipation and revelation complete, it's now time to ponder. 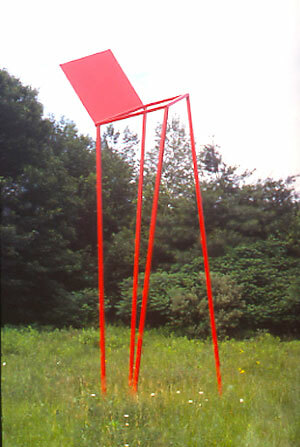 Nature and Balance Exhibit, Arsenal Center for the Arts, Watertown, Mass.